We would like to introduce ourselves as Khaptad FM 98.2 which is (Tapai Ko Aawaz Ko Sahayatri), a Regional FM radio station that supplies dose of Information, Infotainment and Entertainment from 5 AM to 11 PM. We are the only FM Station that is providing the Radio Service through the totally digital equipments The FM has already started to achieve the professional and economical standards since the date of establishment. With its perfect program composition and marketing policies, Khaptad FM is dynamically advancing towards progress and development. The proper blend of information and entertainment with the world-class music from Khaptad FM 98.2 MHz is now the daily requirement & need of the more than 35 lakhs listener as we believe in “The Power to listen”. We reach all over Far western region of Nepal and covering major commercial centers like Dhangadhi, Mahendarnagar, Tikapur, Nepalgunj with major parts of the district of Bardiya, Surkhet, Dadeldhura, Doti, Aacham, and somewhere little parts of Darchula, Bajhang, Bajura and even in Jumla and Dailekh even in main boarder city of INDIA. 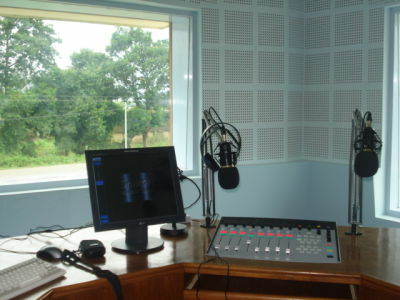 Khaptad FM 98.2 MHz is mainly AIRED, to-provide trusted & independent news, healthy entertainment, aware about social, economical, political and local culture and also inform about agriculture, tourism, and science & technological sector. Thus, our programs are a blend of socio-culture information and current affairs especially targeted towards listener’s choice in particular encompassing a wide variety of national issues in general.